At last my new computer has arrived. I feel almost human again! Yes, it has been over a year. With a new baby in the house, making us 7 in all now, few things occur on schedule or on budget anymore! 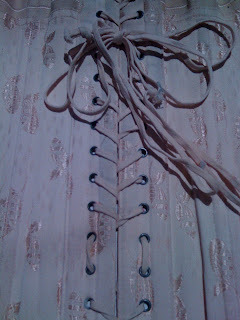 I plan on finishing the under-bust corset as soon as possible and updating those posts soon. I have not, however, been idle. I wrote the pattern and made the 1920’s sweater I was planning. I now need to type up and edit the pattern. I will be making it available soon through eBay. I will also add a post on how to put it together once all the pieces have been stitched along with detailed photographs and tips. It turned out lovely! You will not be disappointed! I love the show, not just the costumes, Julian Fellows is an amazing writer. His characters are so complex and believable and make very unpredictable, painfully human choices. He has a talent of keeping you in suspense and yet delivering exactly the out come you desired in the end, without romanticizing it to the point of unbelievable fairytale dribble. 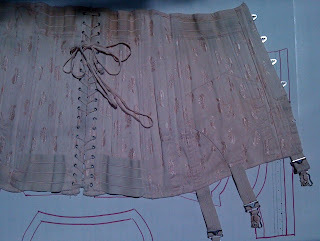 THAT being said (clears throat, slides soap box back under the sewig machine and wipes hands clean on apron), let’s get back to this corset for goodness sake! I often laugh at myself for always picking the most difficult path possible just for the rush of the challenge. This corset its difficult indeed, and therefore all the more rewarding is the sigh of accomplishment when it is complete! Double reverse curves on both sides of the front and back! Bwahahahaaa!! 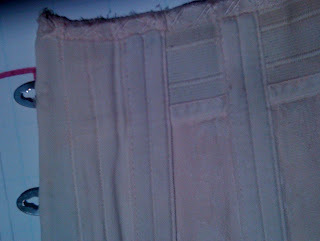 Not just decorative seams, these seams need to be functional and able to withstand the stress that is required of a corset. I started with the easy seams. side front to side, then side to side back and pressed them open and trimmed to 1/4 inch, for both right and left sides of the corset. Then I spent the rest of the day reading and researching the most comprehensive way to accomplish those double reverse curves. It goes above and beyound the average conture of a princess seam and I marvel at the fact that the pattern was presented in a home sewing magazine of the 1920’s. I think in this day in age we rely too heavily on others to do things for us and in combination with technology, we know more facts, but know how to DO less. It’s ever so slightly dangerous! The most comprehensive explanation I found was in the book "Couture Sewing Techniques" by Claire B. Shaeffer on page 54 (This is a brilliant book everyone should have for polishing their fine sewing skills). First of all you need to stay stitch 1/2 inch in along the seam edge of both pieces. 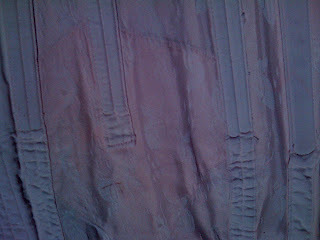 Then with your best friend the steam iron, press and steam the seam under along the basting line of the center front piece of the corset, carefully manipulating the fabric as you go. 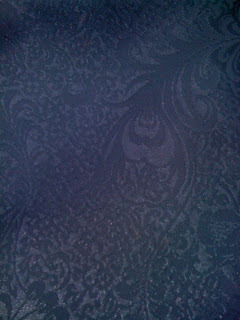 Baste the folded edge of the center front corset piece to the basting line on the side front piece of the corset and baste the two pieces together as seen in these photos. I used red thread to you could see it more clearly. Ah! What a fabulous seam! It makes me giddy!! Strong , beautiful and ever so lightly difficult! 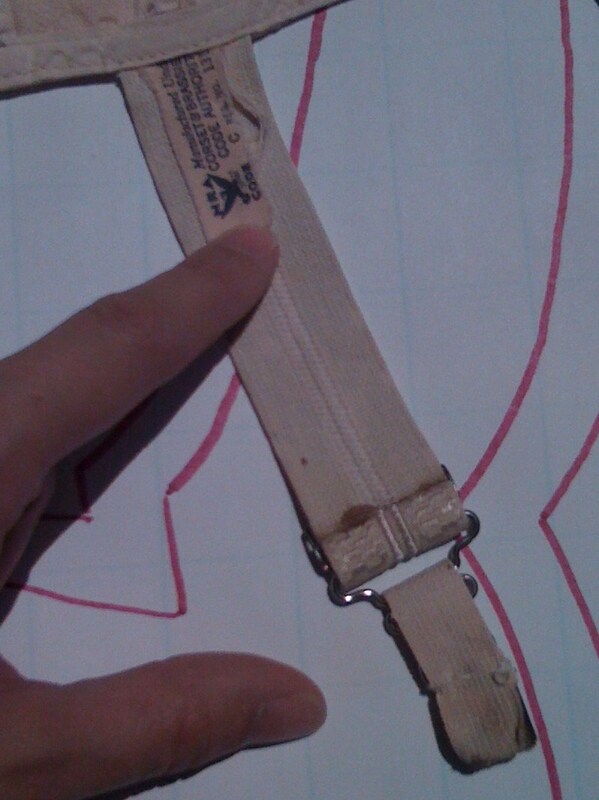 Now use a water soluble marking pen to line up and transfer the fastening points on your busk to the center front pieces of the corset and stitch the two pieces together leaving openings for the fasteners to fit through. I love getting things in the mail! Especially new books!! Today four new fantastic vintage books came in the mail reguarding my 1920's research! One on draping, one on design, and two on millinery. So yes, I believe I will cover hat making in the blog as well!! The book on draping has some fabulous inspriation for period evening gowns and more elaborate afternoon / tea gowns that get my creative wheels spinning. Now that school is back in and I'm down to one child home during the day as opposed to four, things should start to pick up speed again. So bear with me, this should be an exciting winter. I think this winter I will finish crocheting a 1920's sweater I started a while back and blog that too. Let's make sure we cover everything! Maybe gloves too? I think I'll add a page of all the books I have in my Library for my own benefit and your curiosity. The corset is cut out and I'll be uploading construction photo's soon. I still have to order the spring steel for the side supports so I'll have to wait for it to get here. 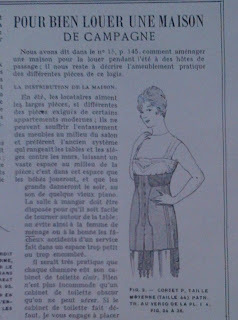 The article in "La Mode Illustree" uses the term "coutil" for the choice of material. The term litteraly translates to "ticking" in the English language. "The fashion Dictionary" by Mary Brooks Picken defines "coutil" as "firm, sturdy type of drilling made of hard twisted yarns, usually cotton, in twill or figured weave. Used for corsets, girdles, etc. French word for drill or ticking." "Drilling" or "Ticking" reffers to a medium weight fabric wth a twill weave. 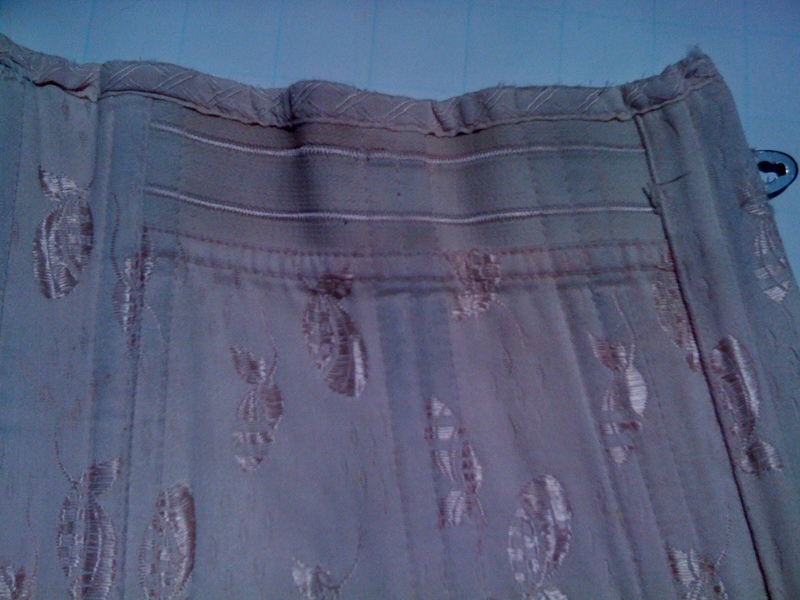 A twill weave produces diagonal lines or ribs in the fabric. 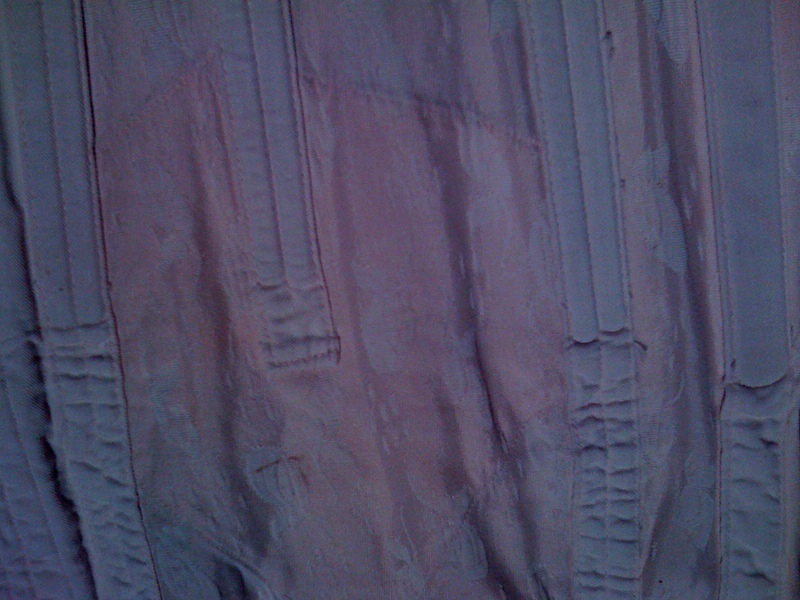 "Drill" includes fabrics like jean and khaki. "Ticking" often uses two colors to produce a stripe, such as pillow or mattress ticking, used for such purposes because its tight weave prevented feathers from poking through. A "figured weave" could include a brocade, damask or jaquard of suitable weight. 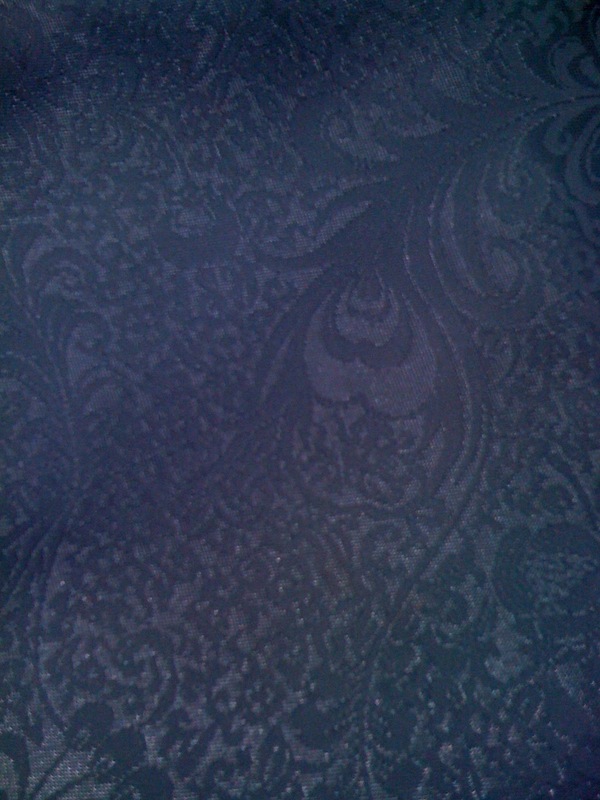 When chosing your fabric for a project you must first concider it’s purpose. In the case of constructing a corset you would need a sturdy, medium weight fabric that breathes well against the body and has little to no stretch to it in order for the corset to accomplish it’s purpose of restrianing the figure. 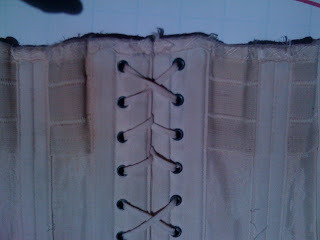 Try not to get caught up in what some corset supply websites lable "corset coutil". Where it is an excellent fabric for corset making , because of its lable can be VERY expensive and isn’t, and shouldn’t be considered the only authentic or suitable choice. 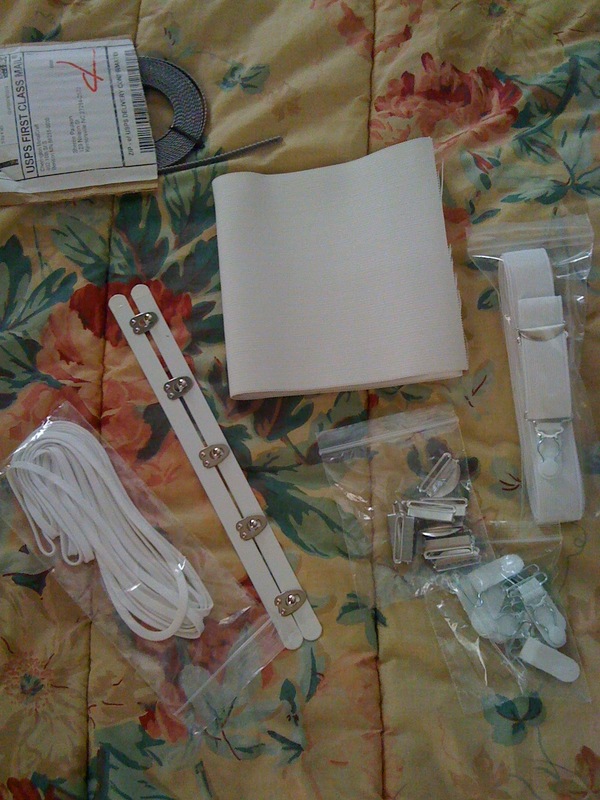 I have gathered all my notions including a metal busk, 1" wide elastic for the garters, 4" wide elastic for the bust gussets, 6 garter clips, spiral steel boning, eyelets and laces. All of which I obtained from various eBay vendors. 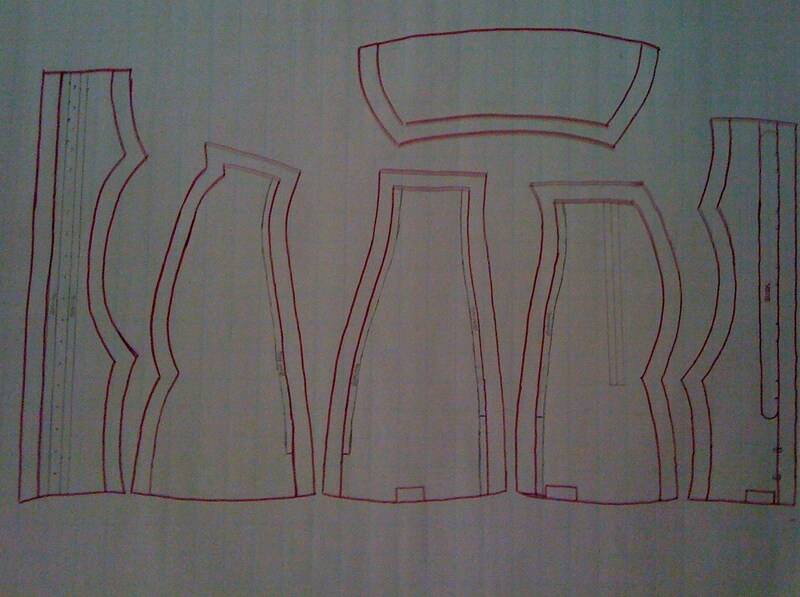 I am so excited to get this corset cut out and start putting it together! 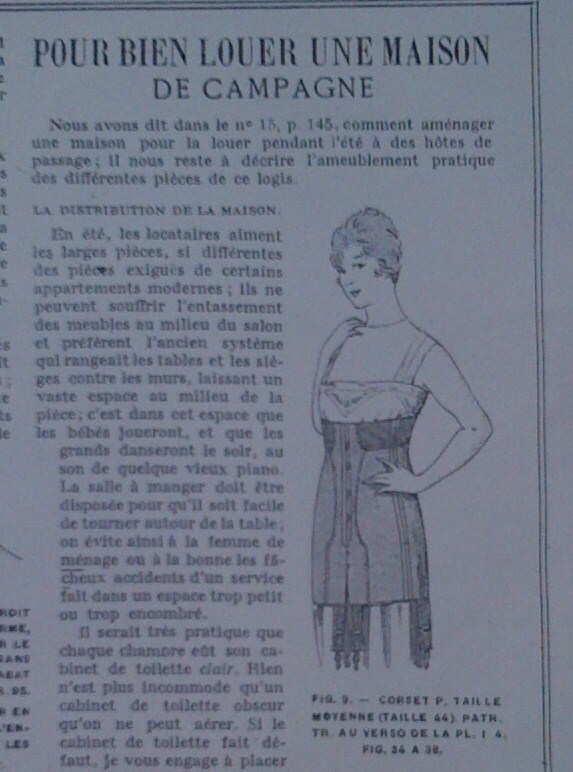 I played around for a while with a tight fitting princess seam slopper and considered the possibilities for a early 1920’s corset and then I stumbled on this lovely corset pattern in a French 1920 "La Mode Illustree" magazine and it was exactly my measurements! I used Google Translate to read the text related to the pattern in the magazine and it gives very little instructions as to assembling the corset, other than to cut out the pieces, mark them and sew them together! It does talk about the benefits and cost of different types of boning but does not name a preference. The article discusses spiral steel, feather boning and whale bone, verifying that all those materials were still in use, at least in France, in the 1920’s. In addition to these pieces I will need to cut casings for the boning channels. As I mentioned earlier my corset that I have is not exactly what I thought it was. 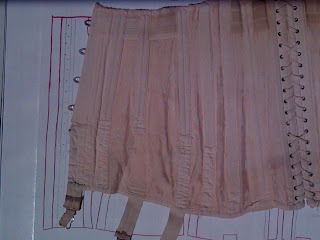 I thought it was a 1920's underbust corset, it is in fact a 1930’s underbust corset. 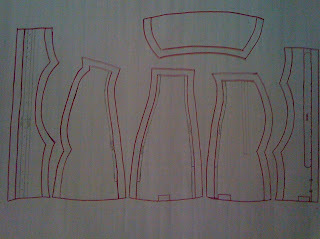 I am not completely disappointed because corset construction did not change drastically in ten years so I can still use it as a source for construction techniques. I thought to myself "What does the National Riffle Association have to do with corsets?!" He he! I have to laugh at myself! So, to Google it was!! The National Recovery Administration was instituted by Franklin D. Roosevelt in 1933, after the war in order to bringing industry, labor and government together to create codes of "fair practices" and set prices. 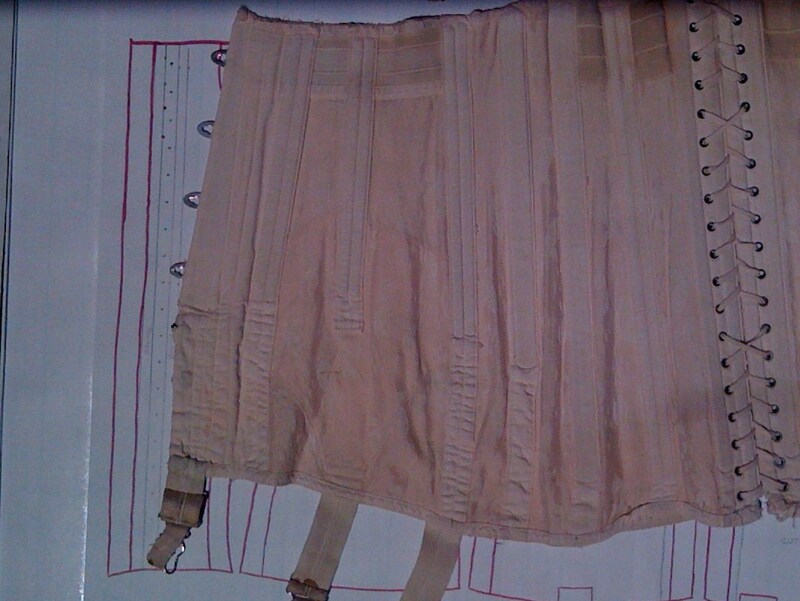 So, my corset was made sometime after 1933. I find this ever so slightly exciting in light of all those dummies out there that still insist, write it as the gospel and publish it as a fact in countless papers and books that women in the 1920’s threw out their corsets forever. 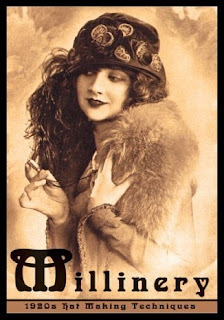 If corsets were still being mass manufactured in the 1930’s, common sense will tell you they were in the 1920’s as well. I do find it interesting that this particular style was still in demand in the mid 1930’s, but then again you wouldn’t catch me in a thong just because the younger generation may prefer them! Nor could I imagine my mother in a demi-cup bra. So again, calling on that common sense, styles just need time not only to catch on but to phase out as well.